The spiritual master of Balak Yogeshwar Maharaj, Sri Paramanand Avadhutji Maharaj, is coming in the Ramanandi-sampradaya [disciplic succession of Ramanandacharya], which is an off-shoot of the Sri-sampradaya, one of the four authentic Vaishnava-sampradayas within “Hinduism”. What looks like a red exclamation mark on Maharaj's forehead is in fact the tilak [sacred marking] in the shape of a bindi [dot] and a vertical line towards the parting of the hair of the aforementioned sampradaya. According to the Ramanandi-sampradaya, everyone is eligible to practice bhakti [devotion to God], and there are no limitations when it comes to caste, gender, age, ethnicity, etc. The Ramanandi’s primarily worship Lord Ramachandra and other forms of the Lord related to the Vishnu-tattva such as Narayana and Lord Sri Krishna. 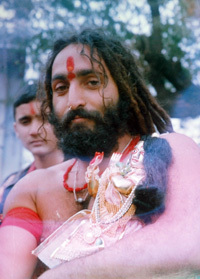 Since the Radha-Krishna Deities had come into Balak Yogeshwar Mahraja’s life [see biography], he became very attached to Them and is calling Them his “Thakurji” [i.e. Lord of his life]. In a nutshell, it can be stated that Maharaj is a Radha-Krishna bhakta [devotee], although he respects every form of God as well as the demigods such as Lord Brahma, Lord Ganesha and Durga Devi who are all considered servants of the Supreme. Lord Shiva, also known as “Mahadeva”, holds a unique key position in the pantheon of “Hinduism”. Maharaj makes the point that if one sincerely worships Lord Shiva, He will bring one to the position of wanting to serve Krishna or Vishnu. 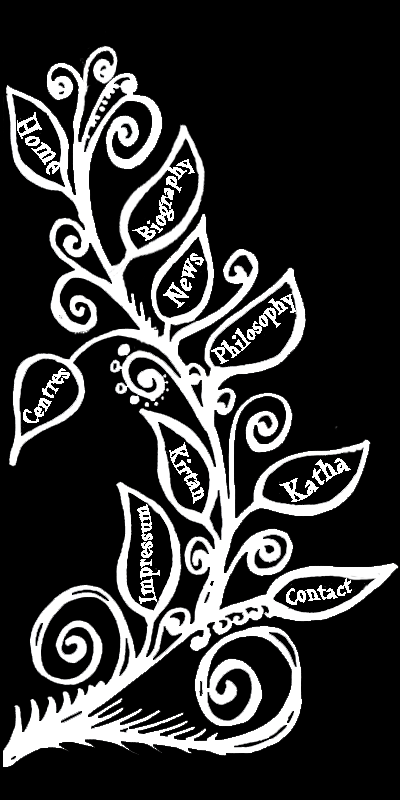 Therefore, it is of no surprise that Maharaj mainly initiates his disciples into a Krishna-mantra (which is also known as guru-mantra since it’s given by the guru to the disciple and it is supposed to be kept hidden). Balak Yogeshwar Maharaj is advising his disciples to always keep remembering God anywhere and everywhere and to chant the given mantra throughout the day. There are no hard and fast rules for remembering the guru-mantra. 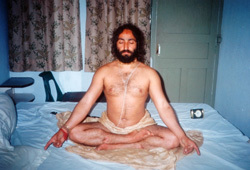 However, Maharaj has instructed his disciples to sit twice a day – in the morning and in the evening – in padma-asana [crossed-legged sitting position] on an asana [mat or cushion] and breathe regularly through the nostrils while mentally meditating on the guru-mantra. The mantra is to be attentively remembered in a three-fold breathing process; once by breathing in, once by holding one’s breath and energy at one’s forehead, and once by finally releasing one’s breath. This process is to be repeated twenty-one times – once in the morning and once in the evening. In general, Maharaj is stressing two main practises in his teachings: Simran [the soft chanting of mantras on a rosary, i.e. japa-mala] and seva [service and kindness] to mankind and all living beings. He repeatedly states that one should be very careful not to exploit anyone. Considering this focus, it goes without saying that whoever approaches Maharaj for mantra-diksa [initiation into the mantra] is expected to follow a pure vegetarian life style free from any kind of intoxication and addictions. One should keep a positive attitude, keep doing positive activities, have faith in God and continuously watch and purify one’s thoughts. 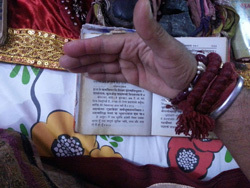 The followers of Maharaj can be recognized by a red woolen rosary with 27 knots which they are wearing around their wrist. Wool is one of the few materials which cannot be contaminated under any circumstance, and these rosaries have been hand-tied by a couple of his female disciples. When this mala [rosary] is chanted upon four times, it equals to 108 mantras which is generally the amount of knots or beads of a standard “Hindu” rosary (4 x 27 = 108). His followers are wearing it at all times. Very few are chanting on it though. It is more like a blessed paraphernalia which reminds them of their spiritual master since Maharaj is personally distributing them during larger gatherings. Another interesting feature in Maharaj’s spiritual practice is the worship of the kanya-kumaris [small girls] which he occasionally does during larger functions. He’s washing the feet of small girls, feeding them, giving them donations, and bowing down in front of them. Sri Vaishno Devi, a great female saint who got bugged by a lusty man during her meditational practices in the mountains of Katra (which is situated in Jammu and Kashmir), appeared to that very man as Durga Devi and destroyed him with her many gruesome weapons. Therefore, the worship of Durga Devi (of which the small girls are being considered an expansion) is deeply imbibed in the culture of Jammu and Kashmir. It is one of the states in India where the ladies are being properly respected. No place in this world can flourish without properly respecting and taking care of its female inhabitants. The Goddess of fortune - Laksmi - of whom Durga Devi is but an expansion, will not inhabit a place where the females are disrespected. Therefore, wherever ladies get disrespected, that place will be disturbed by poverty sooner or later. 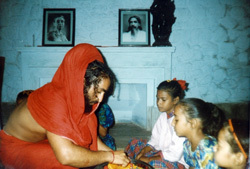 Balak Yogeshwar Maharaj has started this practise of worshiping young girls during his days in Badrinath where he observed the Navaratri-vratta [spiritual vow] strictly. He would completely fast for nine entire days and would perform havana [sacred fire sacrifices] daily. He would not touch anyone, nor was anyone allowed to touch him during these days. On the tenth day of Navaratri, he would worship some small girls in the aforementioned way. He’d be calling Mata Vaishno Devi into the small girls and would perform the kanya-kumari-puja in this way. In return, he’d get support from Devi to accomplish major tasks in this world such as his havana-gatherings and other big projects. 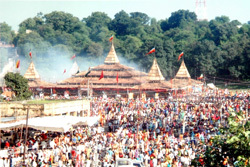 Maya [the illusionary potency of the Lord] would then not create any obstacles and disturbances on his spiritual path. 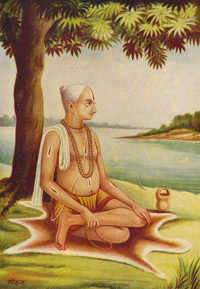 Last, but not least, Maharaj is often repeating the words of the great saint Tulsidas, who compiled the famous Ramcharitmanas [a summary of the Ramayana in verse-form], and who has appeared in the Ramanandi-sampradya. 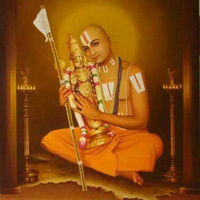 Saint Tulsidas has stated: “Kalyug kewal naam adhara, sumer sumer nar uttara hin para”. The meaning of this verse is that in this age of Kali, only the chanting of God’s divine names is sufficient to sail the human beings through the deep ocean of this material existence. The holy names of the Lord will bless its chanter with bliss and peace and grant him liberation from the repeated cycle of birth and death. Maharaj considers the performance of havana an opportunity to bring a large crowd together in one place and have them chant God’s names together which is a very powerful way of spiritual advancement in this age of Kali. 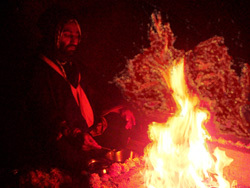 Eventually, no matter how much research one might do on Maharaj’s life and teachings, there will always be a mystical and unpredictable moment about Maharaj which makes him so unfathomable and unique.